The aim of the study is to design and optimize crankshaft for a single-cylinder four-stroke overhead valve (OHV) spark ignition engine. This paper used reverse engineering techniques, in order to obtain an existing physical model. A three-dimensional crankshaft has been created with the help of SOLIDWORKS, and it is imported to ANSYS environment for the coupled steady-state thermal structural analysis. The material used for crankshaft is AISI 1040, AISI 4340, AISI 4140 and AISI 4615. 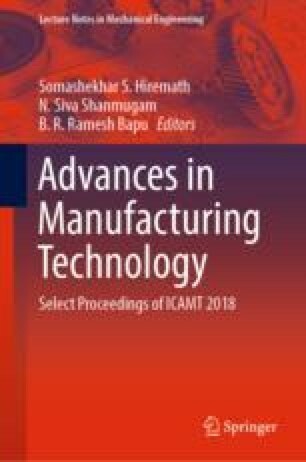 The objective of this paper is to focus on the lightweight crankshaft design through coupled steady-state thermal structural analysis and to optimize the crankshaft design within the design domain using parametric optimization. The results obtained from finite element analysis and parametric optimization concluded, the modified design is safe along the selected materials for AISI 1040 and shows the maximum von Mises stresses 145.66 MPa, factor of safety (n) is 2.8491, and reduced weight of the crankshaft was 63 g which is 4.054% less as compared to the existing crankshaft model without compromising the strength-to-weight ratio.